RE•WORK | Blog - What Happens When Machine Learning & IoT Collide? What Happens When Machine Learning & IoT Collide? Less than 2 weeks to go until we're exploring IoT & Machine Learning in San Francisco! The Internet of Things combined with Machine Learning. What problems can we solve? 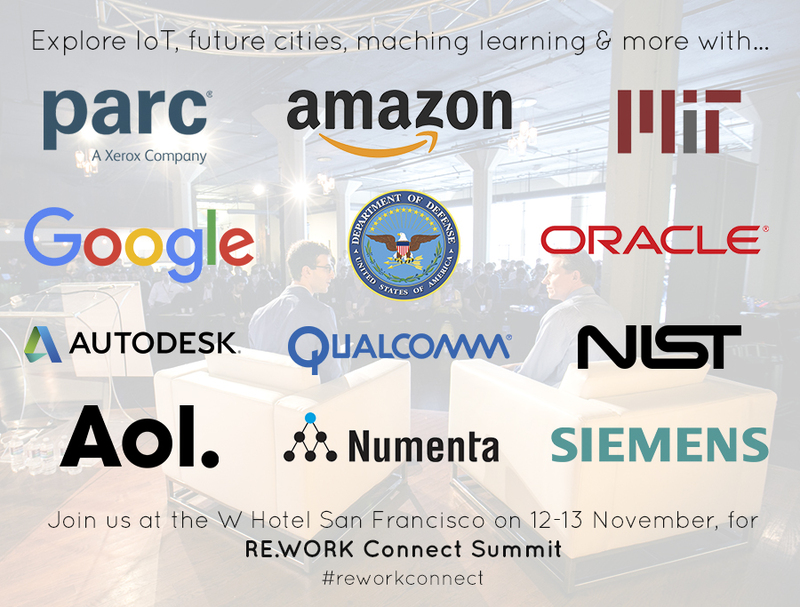 Over 40 speakers and 200 attendees will come together to explore trends, challenges and opportunities at the RE.WORK Connect Summit in San Francisco on 12-13 November. Data-Driven: Enabling the Road Ahead with Big Data from the Connected Car with Steve Banfield, CMO at INRIX. Arghon: they use neural networking and sentient learning technologies, to seamlessly connect users to the world around them. RE.WORK Connect Summit is a unique opportunity to meet and interact with business leaders, influential technologists and entrepreneurs leading the IOT revolution. Attending companies include: Amazon, MIT, Google, Oracle, Autodesk, Capital One, Siemens, PARC, the DoD, Qualcomm, Numenta and more. Last year's event sold out so book your space now to avoid disappointment! View all speakers and details on the event website here.